Every now and again I feel fortunate to stand face to face with a remarkable piece of history. 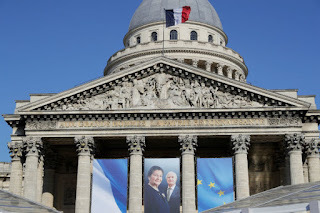 Last week, while I was in Paris, I swung off Boulevard Saint-Michel and strode to the Panthéon where hangs a huge photographed image of Simone and Antoine Veil. They are backdropped by the European flag. I stood alone. There were no tourists, no fellow citizens near me, aside from those passing by. I was able to steal that private moment to reflect upon the life of a truly remarkable women whose sorrows and battles seeded a vision and an energy that changed the fortunes of millions, most especially French women. The week previous I had sat in front of the television for two hours on a Sunday morning, 1st July, with my husband watching the entire ceremony, the panthéonisation, of Simone and her "beloved Antoine". The coffins containing the remains of the pair were being brought for burial to the Panthéon. It was a very hot morning and I applauded the members of the French national guard who carried the two coffins for approximately an hour during which time there was music, readings and dance. 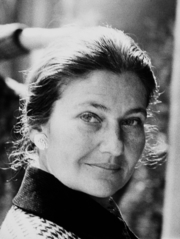 Camille Froidevaux-Metterie, a professor of political science at the University of Reims and author of a number of books on feminism and women in politics, commented that "It is Simone Veil's achievements that are being recognised and it is her husband who joins her in their final resting place, at the request of the family." Many members of their family were present at the Sunday morning ceremony. Afterwards they, along with Emmanuel and Brigitte Macron, followed the coffins into the interior of the city's famous mausoleum. Simone Veil, born Simone Annie Jacob in Nice on 13th July 1927 died 13th June 2017, is only the fifth woman to be laid to rest within the great domed building that dominates that corner of the Latin Quarter. The Panthéon, built originally as a church to honour St Genevieve, later became a secular mausoleum to house the remains of the distinguished citizens of France. Men. The first to be buried there was in 1791, the comte of Mirabeau, who was later disinterred and buried in an anonymous grave. All who rest within the mausoleum, including Voltaire (also 1791), Victor Hugo (1885) were men. It took till 1907 for a woman to enter that sacred space, when a 'great man', scientist Marcellin Berthelot requested that his wife be buried with him. In 1907, Sophie Berthelot became the first woman to rest within these magnificent walls. In 1995, Marie Sklodowska-Curie, twice Nobel Prize Winner, was buried along with her husband Pierre Curie, also a Nobel Prize Winner. Thus Curie became the second woman entombed at the Panthéon, but the first to be placed there in recognition of her own professional merits. Although Marie Curie died in 1934, it took sixty years for her to be given the honour of the Panthéon. And, I have recently learnt, it was Simone Veil who helped persuade French President François Mitterrand to transfer Curie's ashes as an acknowledgement of her contribution to science and medicine. The gender imbalance was, is, embarrassing. In 2015, two more women were laid to rest. Ethnologist and member of the French Resistance, Germaine Tillion's was a symbolic internment with soil from her graveside because her family did not want her body to be moved from where it had originally been laid. The same is true of Genevieve de Gaulle-Anthoniez (niece of Charles de Gaulle and member of the French Resistance), hers was also a symbolic internment for the same reason. 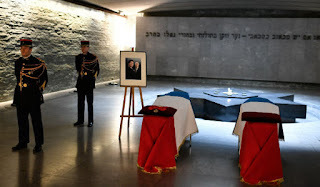 Simone and Antoine Veil had been buried alongside one another at Montparnasse Cemetery before President Macron's decision to move them to the Panthéon, exactly one year after Simone's death. This time, it is the woman who was being panthéonisée for her merit not because she is the wife of a remarkable man, even though Antoine has been recognised for his contribution to society as a civil servant at the highest level. On the Pediment of the Panthéon is written: "Aux grands hommes, la patrie reconnaissante. ""To the great men, the grateful homeland." Honour guards stand next to the coffins of Simone and Antoine at the Shoah Memorial in Paris on June 29th, 2018. Two days before their last journey. As one of more than 76,000 Jews deported from France during World War II, Veil appears on the Wall of Names at the Shoah Memorial in Paris, under the name Simone Jacob. Her father, mother, sister and brother are also listed. Only Simone and her sister, Madeleine, survived their torturous ordeal. Tragically, Madeleine was killed in a car crash seven years after the war ended, leaving Simone without family. Simone Veil has been a heroine of mine for many years, one of the most remarkable of modern women. A survivor of the camps of Auschwitz and Bergen-Belsen, she returned to France at the age of seventeen emaciated and traumatised. She threw herself into her studies, gained her masters in law and swiftly rose within the ranks of public life. She played an important part in raising awareness of the Holocaust and also of speaking out about France's role in the deportation of French Jews. A subject that many in France have been reluctant to own up to. The collaborationists were not called out as vocally as perhaps they should have been. Veil played her part in making sure that France did not forget its past. This experience also fired within her a lifelong dedication to the ideal of Europe, European integration and Franco-German reconciliation. She was elected the first President of the European Parliament, a role she held until 1982. She never lost that fire, that passion for Europe. She said, "When I look back on the last 60 years, it is still our greatest achievement." She never called herself a feminist and yet as Minister for Health (1974 -1979), she fought for women's rights. She facilitated access to contraception, pushing through a bill that legalised the sale of contraception and contraceptive pills. Perhaps her greatest achievement for women was the determination with which she fought for the legalisation of abortion in France. This was no easy battle. France is, or was back then, a country rooted in Catholicism. It was a very hard fight and many raised their voices against her - Simone and her family were publicly reviled - but she did not give up and in January 1975, abortion was legalised n France. Throughout her career she played an important role in human rights issues, the environment, public health, food and safety, Aids care. She worked with young mothers, single mothers, disabled children and HIV-positive patients. She entered the Académie française in 2008, only the sixth woman to take a seat there. On her sword - every member of the Academy is given one - is engraved the motto of the French Republic (liberté, egalité, fraternité), the motto of the European Union, (Unis dans la diversité.) and her Auschwitz number: 78651. Emmanuel Macron, in his speech on 1st July, spoke out this number, Simone's tag and it was followed by a minute's silence which was heartbreakingly moving. I asked myself again about the girl who bore that series of figures. That pretty adolescent, dark-haired girl in the camp stamped with the number 78651, can you imagine her heartache, and her strength? Losing her family, perhaps too scared, too depressed and alone to believe that the horrors would ever be over. Yet, in spite of all that she endured, suffered, the profound losses she faced, a seed was born. The seed of humanity, the courage to fight for all that is good and peaceful. I think this is why she was and remains a heroine, a role model, for me. She could have come home from those horrors angry and broken. Instead, she grew up to fight for the plights of those who were not in a position to fight for themselves. She pushed with enormous determination and vision for the vision of a United Europe, a Europe within which the member countries are working together, respecting their differences, but working towards an integrated and peaceful future. A dream I hope we can continue to fight for. 78651, Simone Jacob, Simone Veil, I pray you rest now in peace and in honour beyond a life richly and generously lived. You remain an inspiration. Beautifully written. I learned a lot about Simone Veil and her contribution to France and to humanity. What an admirable woman! Thank you, a beautifully written tribute to a remarkable woman! Superbly written article about an outstanding woman.... I think these articles deserve a much more widespread readership as they are so fascinating. Any plans to publish a series of books using this and previous equally inspiring stories? Thanks, Carol, this is a really inspiring piece.